Designed for cats & kittens that may be sensitive to certain types of protein or carbohydrate sources. Made without high-water, low-protein meats and common grains like corn, wheat or soybeans this carefully blended formula contains high quality chicken meal, wholesome rice and omega-rich menhaden protein. Balanced Omega-6 and Omega-3 fatty acids promote healthy skin and hair coat. 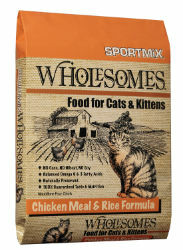 SPORTMIX® Wholesomes™ Chicken Meal & Rice Formula supplies your cat with a naturally preserved, 100% complete and balanced diet for a healthy active life. Calorie Content (calc. ME) 3,590 kcal/kg, 380 kcal/cup. Chicken Meal, Brown Rice, Rice Flour, Chicken Fat (Preserved with Mixed Tocopherols), Menhaden Fish Meal, Natural Flavors, Dried Egg Product, Choline Chloride, Salt, Brewer’s Dried Yeast, Potassium Chloride, DL-Methionine, L-Lysine, Taurine, L-Carnitine, Calcium Sulfate, Vitamin A Supplement, Vitamin D3 Supplement, Vitamin E Supplement, Zinc Sulfate, Ferrous Sulfate, Niacin, Calcium Pantothenate, Riboflavin Supplement, Copper Sulfate, Pyridoxine Hydrochloride, Thiamine Mononitrate, Manganese Sulfate, Zinc Proteinate, Manganese Proteinate, Copper Proteinate, Calcium Iodate, Cobalt Carbonate, Folic Acid, Sodium Selenite, Biotin, Vitamin B12 Supplement. *Not recognized as an essential ingredient by the AAFCO Cat Food Nutrient Profiles.